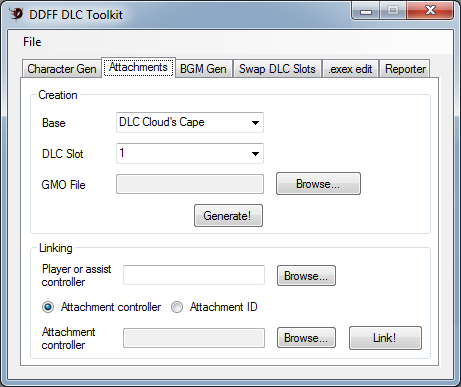 Here is a tool which will ease your DLC creation/edition needs: DDFF DLC Toolkit! Easy Character DLC generation: you can now create character DLCs easily without meddling with hex values, just select the character, slots, models and portraits and that's it! DLC Attachments: you can create new attachments from scratch with ease and link them to your existing DLCs! Easy BGM DLC generation: you can now create BGM DLC packs from scratch or from an existing source! Swapping DLC slots: you can swap existing DLCs slots to fit your needs! EX-Mode Aura/.exex edition: you can select the colors that you want for your character's EX-Mode aura using a simple graphical interface! You can also customize all the EX-Mode auras that a character has! DLC Reporting: you can view your currently installed DLC data and export it in easy-to-handle Excel spreadsheets or text files! This tool is useful to keep track of your installed DLC or for checking DLC incompatibility issues. Windows (it should also work on virtual machines in Linux and/or Mac which meet the rest of requirements). Tested on Windows 7 and 8. I'll host all the releases in my Github account; just go to the GitHub's release page and download the "ddff_dlc_toolkit" .zip file. Removed 36 characters limitation in song names. Now the user will be notified that exceeding that size may not render the name properly in-game. Thanks to convalise for the suggestion! Fixed bug that generated wrong names for songs with hex numbers that contained uppercase letters. Thanks to Lugia2009 & convalise for the bug report! Decompress the .zip file and run the ddff_dlc_toolkit.exe file. Simple as that! 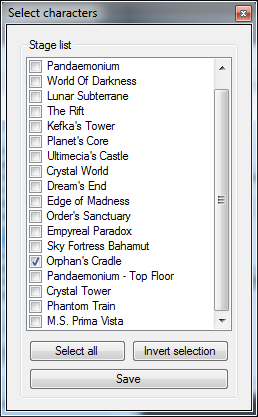 Here you can select your main DLC folder (by default, it's in the "dlc" folder in the executable's folder) and a few other options that you can tweak for your tastes. Character: As the name implies, the character that you want to generate the DLC files for. NOTE: Aerith DLCs don't work, there must be some issue in-game for that, you must override an existing slot for them to work. DLC Costume slot: The game provides 9 DLC slots for each character to use. Select the one that fits your needs. You can also select Normal, Alt.1 & Alt.2 & Manikin costumes for those characters that allow it. Include manikin effects: if you leave this checked, then your DLC will include data from the manikin version of the character, including voices & EX effects. NOTE: The Player GIM File 2 will only be enabled if you select Cecil as the character you want to create your DLC for. When everything is ready, just click "Generate!". 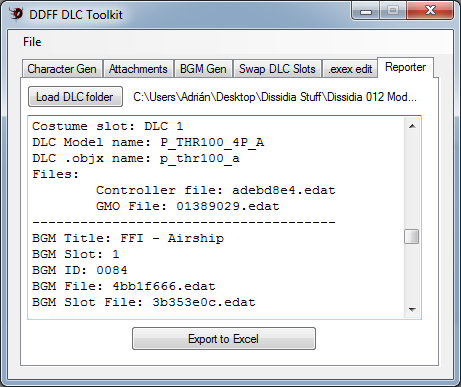 This will generate the DLC files in the "dlc" folder next to the program executable. The Creation tab let us create new DLC Attachments given a DLC Attachment base (the original attachment that you're using to create your custom attachment) so it can retain the same physics data as the original, the DLC slot, and the GMO that you want to use for it. 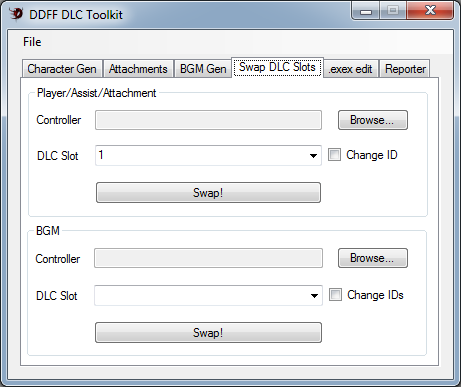 This will generate the DLC files in the "dlc" folder next to the program executable. The Linking tab can link any player/assist controller with an existing attachment controller or an attachment ID. Just select your base player/assist controller and an attachment controller or ID (in big-endian format, as the DLC reporter tab reports them) and click "Link!". This will overwrite the file that you loaded, as well as keeping a backup of that same file in the same folder where the original .exex file was located. Simple, huh? The DLC Slot box lets you select in which slots will your songs be. 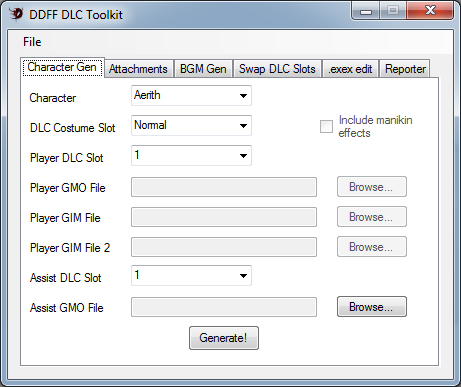 You must select one for the tool to generate the DLC properly. You can add and remove new BGMs using the Add and Remove buttons. You can also alter the selected track position by using the Up and Down buttons. The BGM's title. The interface will notify you if the text may not render properly inside the game (it may overlap with other UI elements in the game). You can choose to ignore the warning if you want. The AT3 that you'll use for this song. For existing BGM DLCs, the tool will try to locate the corresponding .edat if it is in the same folder. You can even let it blank if needed. The Characters by default button will allow you to select the characters for which the the BGM will be picked as default in the "before battle" screen. The Stages by default button will allow you to select the stages for which the the BGM will be picked as default in the "before battle" screen. When everything is ready, just click Generate! and you'll have your BGM ready to use in your main folder. The interface is simple enough: pick your kind of controller, select it in the appropriate section, choose the DLC Slot that you want to use, and then click Swap! The Change IDs check box allows you to also change the controller's/BGMs IDs to ones suitable to the given slot. Just use it if you know what you're doing! 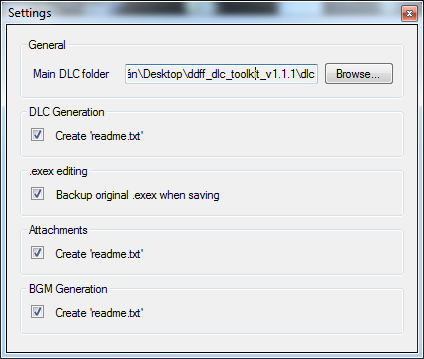 In order to use the .exex edition interface, you first need to load an .exex file (generated via the DLC generation tab, for example). The .exex files usually have a size of 88 bytes (most characters), 168 bytes (Cecil and Onion Knight) or 248 bytes (Lightning). From this interface, you just need to click on the color boxes and change the colors to whatever you want. When you do all needed editions, press Save .exex!. This will overwrite the file that you loaded, as well as keeping a backup of that same file in the same folder where the original .exex file was located. 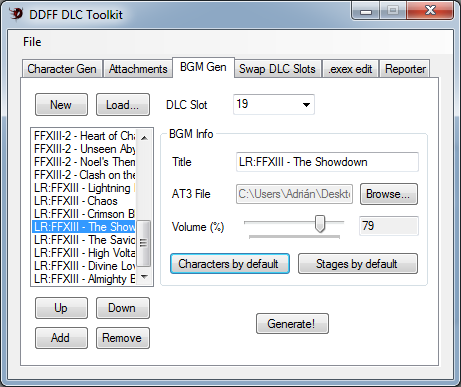 This is pretty easy to use: just load the folder where you have your installed DLC and the text box will show you a list of the currently installed Character & BGM DLCs data and files. You can then export this information to an Excel spreadsheet. 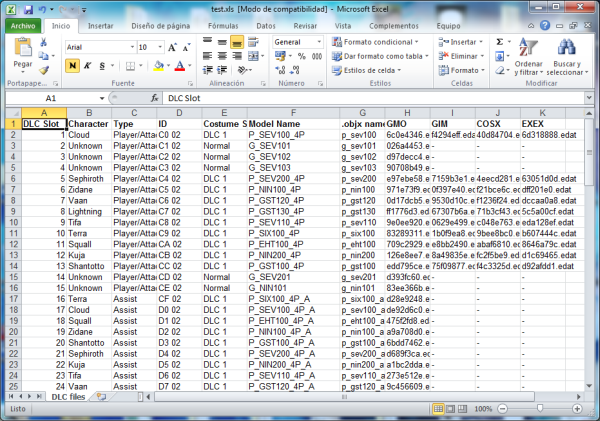 Keep in mind that this Excel spreadsheet has two worksheets: one for Character DLC files and another for BGM DLC files! DLC Toolkit version: The DLC Toolkit version. What you think the correct behavior should be. (edit) alright so i think i figured out how the player dlc slot thing works it relates to what save slot you're using, right? think that would be good to explain, now how do i get my .mp3 files to a .at3? Hello friend. Could you help me with the DLC swap thing? 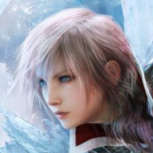 I have a mod for Cloud DLC1 but I don't want it to be replaced so I want to change it to DLC 2. I used the swap DLC slots tab and selected the controller for player/assist/attachment and selected "swap to slot: 3". It showed a success text but when I go to Reporter it says DLC slot: 3 (before was dlc slot: 1) but down there says costume slot: dlc 1. Does that mean it still overwrites the Cloud DLC1? Or it worked? Also, there are 2 more EDAT files for that mod I haven't touch. Do I leave them just like that? Changing DLC slot is different from changing Costume slot. The costume slot is the one you can access in the game. The DLC slot is just an index for the game to read. 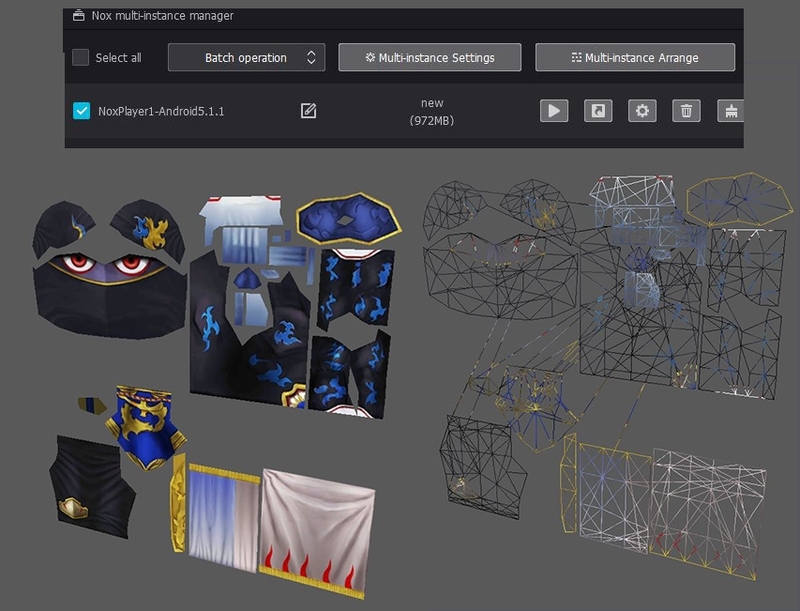 Question, is there a similar such tool for Opera Omnia? Question, is there a similar such tool for Opera Omnia﻿? 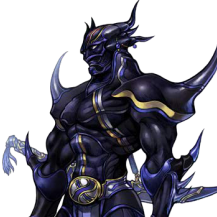 Counter-question, have you SEEN any character mods for Opera Omnia? Nope (Uncertain if that response is snarky or sincere). Which is exactly why I'm asking. I'm not one to stand still simply because I can't find anything on a subject of interest. That said, I don't know if this is the right place to post for this, but please feel free to correct me if I'm crossing any lines I'm not supposed to. It's not necessary to chase me with pitchforks and torches because I'd gladly comply with any rule / penalty that may result from the nature of this post. 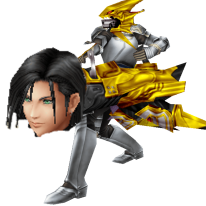 I did some amateur 3D ripping way back in 2009 / 2010 (Kingdom Hearts, the first Dissidia, the early Arkham games). Interested to get back into it again. When I go ahead and run Ninja Ripper on the Nox Android 5.1.1 anyway - I am successfully able to see the DDS files, and even the mesh files. Unfortunately, for some weird reason, the 3D geometry is being flattened into a plane shape, that follows the UV mapping of its corresponding 2D texture. I tested the same steps above with a different game (Marvel Contest of Champions), but instead of a flat plane, the characters are being crushed into a perfect sphere. Guy on Deviantart said that this tool (http://forum.xentax.com/viewtopic.php?f=16&amp;t=18042) works but the textures end up corrupted or something. If you can mix the two together, it should be able to work. 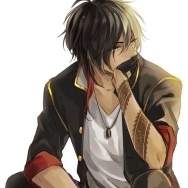 I think. Here's a link to the MP3 > AT3 audio converter for modding in music, when using the tool make sure to put the audio bitrate at or below 128 or it wont play, also in order to convert the MP3 file must be in the same folder as the executable. 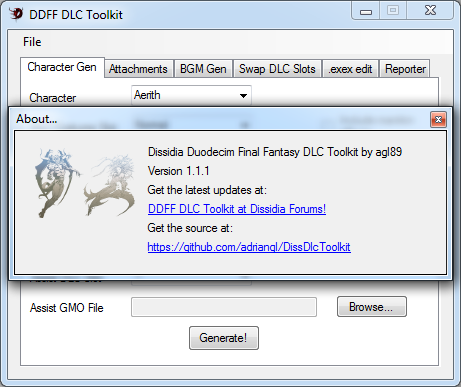 And here's a link to the Dissidia Suite program, for any modding needs not covered by this tool. Hello, i wanna ask a question. I'm still new to modding especially with this dlc generation thing, so i wanna ask where can i get this .gmo /.gim files? all the mods that i downloaded so far is .edat and i kinda want to make a placeholder dlc to put some mods that i wanna use it the future. is that it ? wow that's easy, thank you so much. but the model file that i use doesn't matter as long as it is the same as the character right? Feedback, civil discussion, questions, miscellaneous stuff, humor, etc pertaining to that thread welcomed here. DISCLAIMER: The actual ruleset is past the 3rd "_____________________" all the way below. On the surface, when you look at the final product, it is just an in-game change of values and a series of Ability bans, Equipment bans and a purposeful x3.1 Booster multiplier limit garnered after countless hours upon hours of discussion and debate. Heck, you could compare this to how the Street Fighter series had its own fair share of remixes / revisions / Editions / Arcade Editions etc. and changes in gameplay balance / mechanics. But instead of summarizing and trying to explain how the average match with this ruleset actually feels, I will say this: I am an absolutely firm believer of showing instead of telling. Thus, on the basis of that statement, I cordially invite you to try it. In fact, I fervently encourage you to do so. Perhaps the DFF veterans may quite enjoy how this version of the game feels. And without further ado, here it is. Your Booster multiplier limit CANNOT be greater than x 3.1. Your Base BRV CANNOT be greater than 1250. Level Gap >= _________ boosters. Concentration / + / ++. You may equip Counterattack or Sneak Attack, but you may ONLY have one of either. Achy / Achy+ was banned because of the effect of Full Assist Charges. That being said, for those out there who use CWCheats in friendlies, there is a code that disables Assist Charges by default as long as all connected players have that code active while fighting. Go figure. 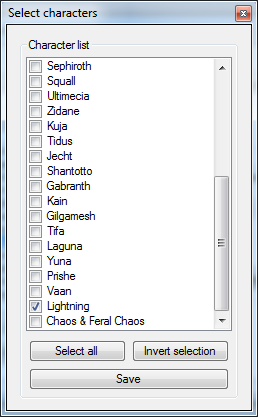 Here is a file link to a seperate Save Data containing the ruleset itself in the 2nd slot. It does not contain any pre-made builds for characters because that is ALOT of work. Maybe I'll do it later, I don't have enough time right now. Or you could make your own builds.